[PDF] Handbook of Public Relations | Free eBooks Download - EBOOKEE! 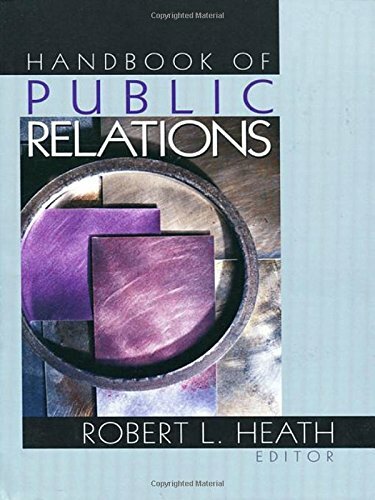 Description: The Handbook of Public Relations offers a comprehensive and detailed examination of the field. It gives scholars, practitioners, and students a solid review of the status of the scholarly literature, stressing the role that public relations can play in building relationship between organizations, markets, audiences, and publics. Review "This handbook provides a comprehensive examination and review of the theory, academic research, and professional practices of the public relations discipline. Ninety leading scholars and practitioners from around the world provide insights into the historical and changing role of public relations in building relationships with organizations, markets, audiences, and publics . . . . The extensive bibliography includes more than 2000 references, some multidisciplinary, which serve to enhance understanding of public relations. The detailed index is user friendly. A must for academic collections serving scholars, practitioners and students, upper-level undergraduate and graduate"
No comments for "[PDF] Handbook of Public Relations".